I am not letting any secrets slip in saying that the world has become much more authoritarian in the last decade. The largest countries in the world: China, India, the US, Russia, Brazil are all now ruled by authoritarians. The concentration of power in a few hands is not an isolated development; our networked, interconnected world is designed for concentration: of wealth, of fame, of power. The keyword I want to focus on here is design. I am not a conspiracy theorist - I don't think there's a secret cabal of men in tuxedos smoking cigars and dividing up the world according to their interests. Yet, there's a definite sense in which the world we inhabit today is designed to concentrate power. I am going to call it emergent design. "As recently as 2005 and 2006, House committees met 449 times to consider actual legislation, and Senate committees met 252 times; by 2015 and 2016, those numbers plummeted to 254 and 69 times, respectively, according to data compiled by the Policy Agendas Project at the University of Texas." There's much less room for individual dissent - members of Congress have to follow the party line or face primary challenges down the road, fewer fundraising opportunities and other pathways to power. The delegation no longer decides their vote - the leaders do, and lobbyists have much greater access to the leadership than their own rank and file. The only exception is if you're independently wealthy or famous (or both in the case of Trump), but that means Congress is staffed with two types of people: partisans and oligarchs. 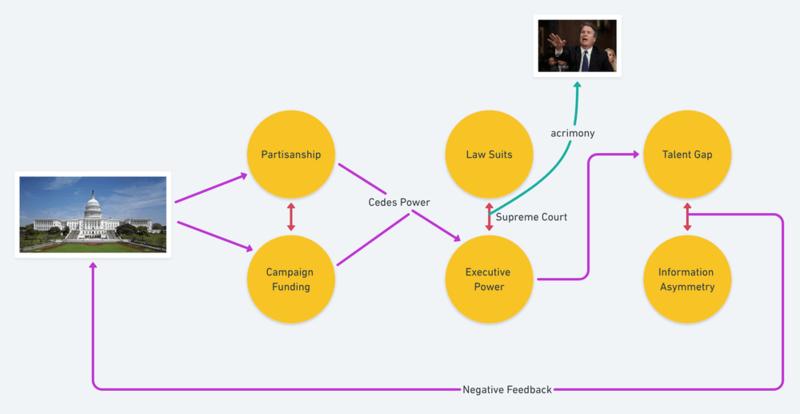 Emergent Design Pattern #1: Partisanship has a positive feedback loop with rising campaign costs. Consequence: More power to the party leadership. But of course, internal fighting within Congress is nested within competition between the three branches of government. So what happens when Congress abdicates its job? The executive steps in; policy is enacted by executive order rather than legislation. "As heated Senate hearings on a Supreme Court nominee kicked off in early September, Sen. Ben Sasse, R-Neb., devoted his opening statement to explaining why the judiciary confirmation wars have become so rancorous. His argument: Presidents fill the void when Congress cannot act, leading to lawsuits and leaving the courts to resolve disputes." Emergent Design Pattern #2: When the law cannot be enacted, it becomes an instrument of popular contention, with law suits battling with the president and the Supreme Court acting as umpire. Consequence: Supreme Court nominations become a meta-level battleground. So the executive takes advantage of congressional gridlock to seize more powers. Someone's got to do the job, right? The executive has another advantage: it has an entire bureaucracy working for it, which means that the expansion of executive powers can be institutionalized by expanding the bureaucracy, opening new branches of the executive and asking for more money to pay for these new salaries, equipment etc. The executive now has more money and patronage to offer, so it can hire better people; plus, why would a talented, ambitious person choose to tie their lot with a losing system, i.e., the legislature? Emergent Design Pattern #3: Executive power and wealth translates into expertise and information asymmetries. Consequence: Smart people don't become congresswomen and men. Congress is even less likely to house people who can negotiate the complexities of a complex world. The President (perhaps not this one!) has access to top-drawer talent and large, specialized institutions whose job is to crunch the data to suit his mood. How can generalists who spend most of their time fund-raising hope to compete with the executive branch? Consequence of 1, 2, 3 put together: Congress loses out in each iteration. Of course, not all of us care about Congress and since I am not an American, I don't have a direct stake in the outcome. But this cascading series of negative design patterns is present everywhere - in economic affairs, international trade and in the tussle over climate change. Anyone who's concerned about the current state of affairs should keep an eye out for these emerging design patterns of global society; at each stage in the game, new patterns emerge that work in the favor of those with power and against the needs of the multitude. What are these patterns? Can we catalog them? Can we devise antidotes to the patterns that work against the people's interest? How? Moral of the Story: Design is no longer what you buy at Crate and Barrel or an Apple store. 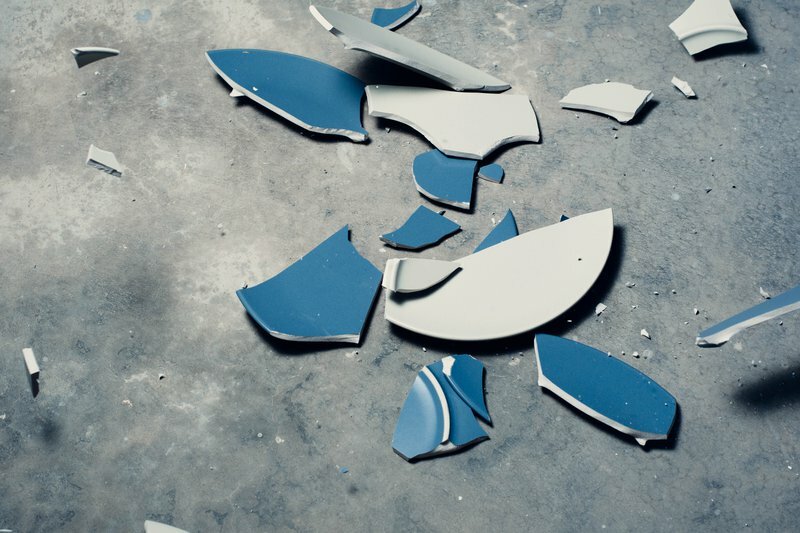 It's essential to understanding how the world works today and equally importantly, we will have to pay as much attention to the design of failure as to the design of success.